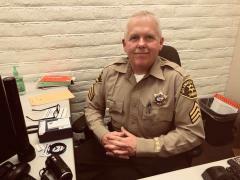 We would like to introduce you to our newly appointed Crime Prevention Unit (CPU) Sergeant at Santa Clarita Valley Sheriff's Station, Dan Dantice. Dantice has been with the Los Angeles County Sheriff's Department for over 26 years. If his name sounds familiar, he served as a deputy at our station for three years, from 2012 - 2015. Two of the three years, he was assigned as one of the zone leaders within the Crime Prevention Unit. Dantice is excited for the opportunity to come back as the sergeant of the unit, and is looking forward to connecting with the community. The Santa Clarita Valley Sheriff's Crime Prevention Unit utilizes partnerships with the community to identify crime trends and implement plans of action to combat issues of concern. There are Crime Prevention Zone Leaders assigned to your neighborhood. They are your partners in crime prevention. Zone Leaders act as liaisons between the sheriff's station and the community, providing a consistent and personal point of contact. *Please leave phone messages for Deputy Snover or Deputy Rooney on Sergeant Dantice's contact number, 661-799-5802.